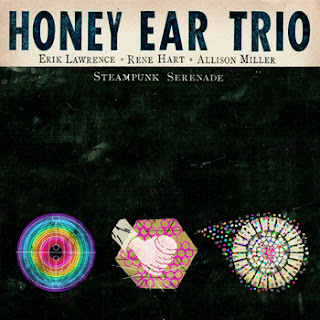 "Steampunk Serenade" is the debut album for this jazz combo Honey Ear Trio with Erik Lawrence on Saxophones, Rene Hart on Acoustic Bass and Electronics/Looping, Allison Miller on Drums and Percussion. Very souple, elastic and warm interplaying between these three guys who played alongside artists as diverse as Sonny Sharrock, Levon Helm, Marty Ehrlich, Don Braden, James Hunter, Allen Toussaint, Ani DiFranco, Dr. Lonnie Smith, Martin Medeski and Wood, Bilal, Bob Dylan, Brandi Carlile, Branford Marsalis, to name only some and that's already a list. Stream the album below, there's also a cover of "Over The Rainbow", but please don't stop to that track only. The album has already been issued by Foxhaven Records.